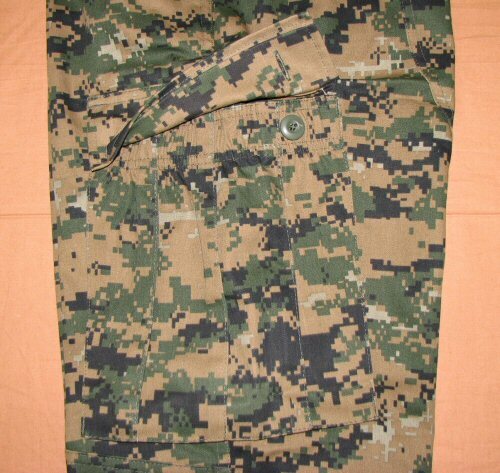 The Bulle US NYCO Marpat Trousers, or Marine Corps Combat Utility Uniform (MCCUU) Trousers are an authentic to original, 65% Cotton, 35% Polyester, medium to heavyweight twill trouser. 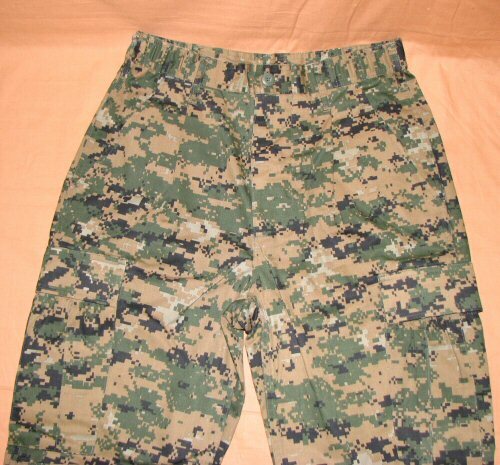 The pants come with the following true to original features: part elasticated waistband, button waist and fly, four-pleat leg pockets instead of traditional BDU pockets, elasticated leg pocket openings, angled knee reinforcement patches, seat reinforcement patches and removal of drawstrings on the ankle hems to prevent unwanted catching or snagging. The knee reinforcement patches open from the inside to allow for the insertion of padding, which is also true to original. The 65% cotton, 35% polyester fabric is quicker to dry compared to a similar weight and weave of 100% cotton. It is also more colourfast and wrinkle resistant than 100% cotton, and will machine wash. 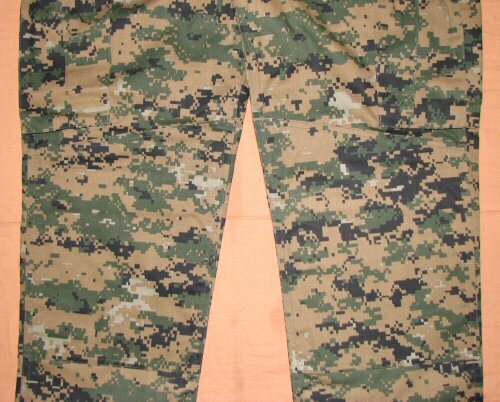 The seams are reinforced with double overlock stitching and bar tacked at stress points. 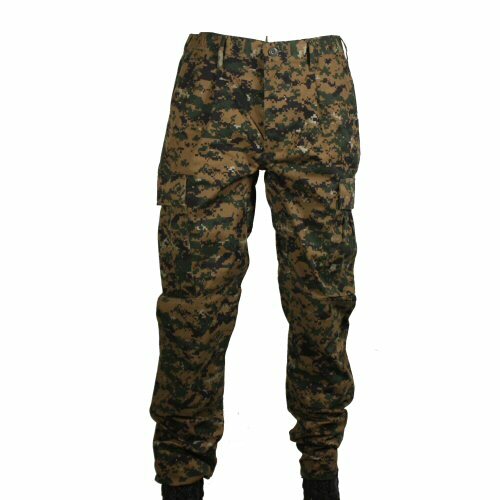 The trousers come in sizes S to XXL and can be matched with the NYCO MCCUU shirt in woodland Marpat and NYCO woodland Marpat headwear. 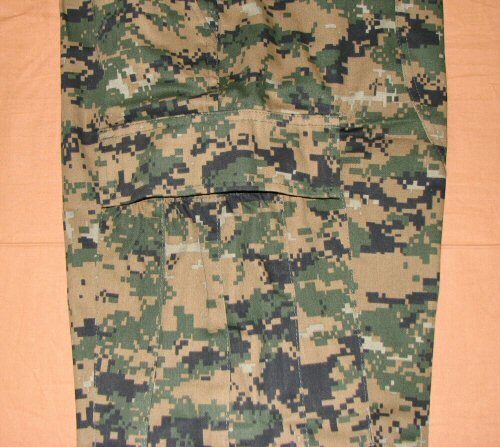 View of top front of trousers. 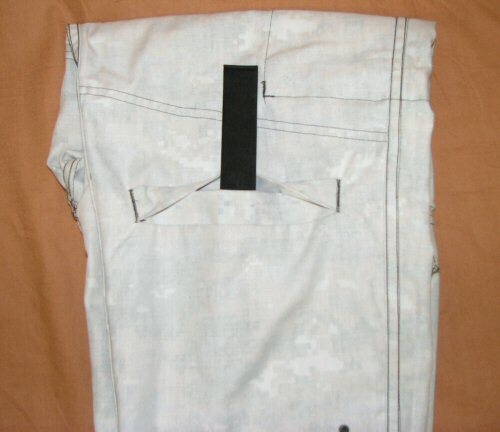 View of the button fly on the trousers. 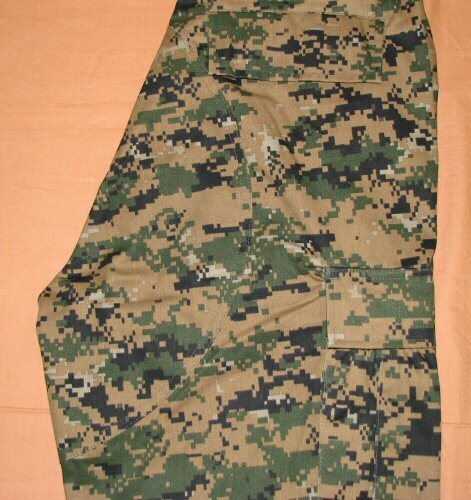 Also visible is the pleat under the front belt loop which is a feature of the original trousers, and the side elastics. Detailed view of the rear pocket which opens with two buttons. The top of the seat reinforcement patch is also visible, as is the elasticated section on the side of the trouser. 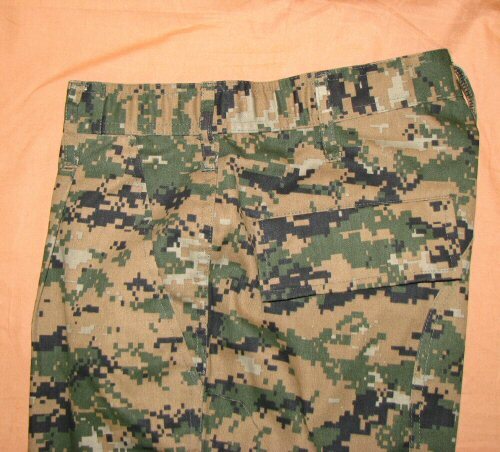 View of the top waistband, showing the elasticated section. 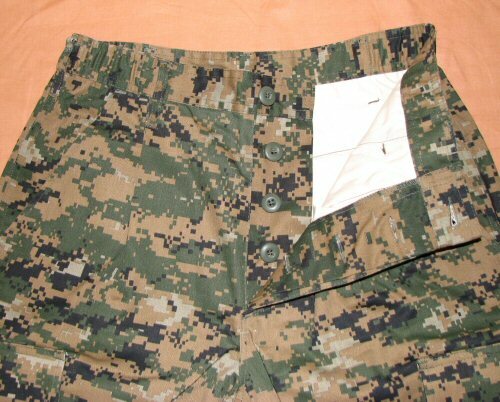 The pleat on the front is clearer to view, and the hip pocket and rear pocket are also visible. Detailed view of the leg pocket. 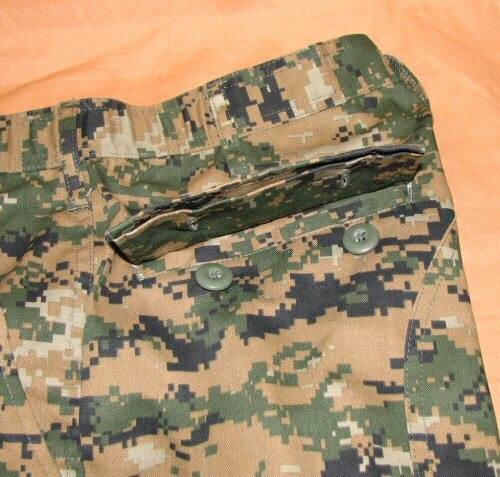 This is a slightly different design to the standard BDU pockets in that it expands with an extra pleat, and the top of the pocket is elasticated to prevent items from falling out. Detailed view of the leg pocket, opened. The front of the flap is tacked down, like on the original. The rear opens with a hidden button. 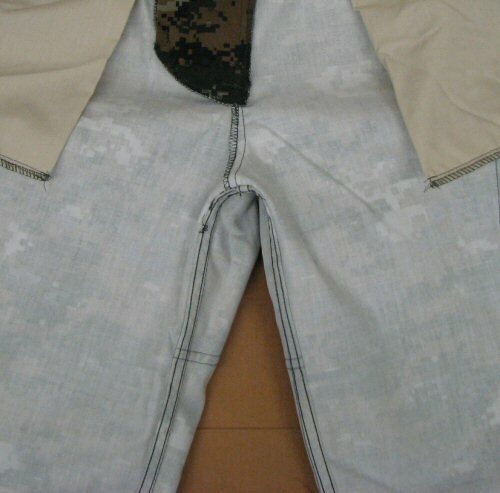 Detailed view of the reinforced knees of the trousers. These are angled upwards towards the inseam, as per originals. Detailed view showing the seat reinforcement on the trousers. This covers a large area, like the original. The trousers inverted, showing the double overlock stitching on the inseam. Detailed view of the double overlock stitching on the rear seam of the trousers. Detailed view of the inside of the trouser where the knee reinforcement patch is located. The internal pocket allows this to be padded out, and a small drainage hole located on the bottom right of the reinforced area.